Not very surprisingly, the first card that comes up is the two of swords. A message of balance here, and strength even in the face of the unknown and uncertain. 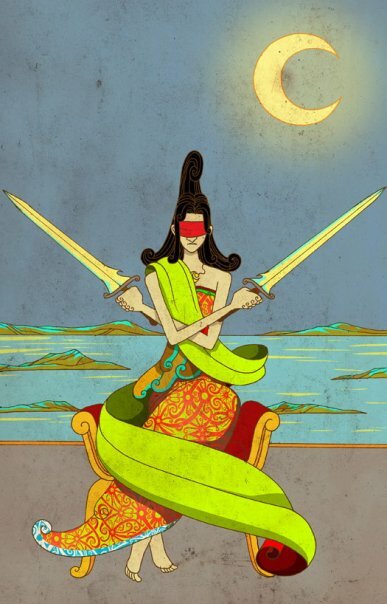 The lady here keeps holding those two swords up, both raised exactly to the same degree, in spite of that blindfold. 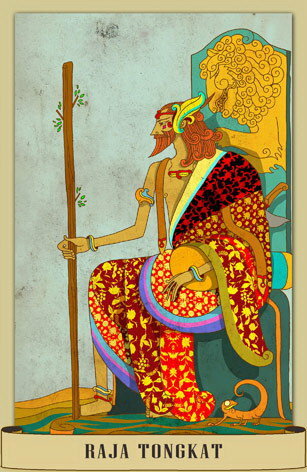 The second card reinforces that this too, is in fact an aspect of the whole thing where balance is needed. It reminds me of some advice an aquaintance shared with me not too long ago, about how ideally interviewing is a two way process: you too, are deciding whether going with their position is worth your while. When they ask you if you have questions, the best reply in not some formulaic why I would be a great worker in disguise type question, but you wanting to know: how does your organization fit my goals, skills, career plans. Of course that's ideal. When you are desperately in need of any kind of income...well. But in my case, I am interviewing for internships, most of them unpaid. Yes, I need the professional experience on my resume, but they are getting my time, intellectual abilities, skills, experience, all of that for free. Not so much a position of powerlessness. So speak to them as equals, have confidence. Other cards could also denote confidence, personal power, but with the king that first aspect in particular comes across deliberately strong. This king has power, and energy, momentum. He grips the staff, ready for action. He is not desperate, or terribly afraid of being judged and found lacking - he's doing some judging of his own. Things swing in both directions: yes, balance. What do you think about my new deck now launched on Kickstarter, The Tarot of Creativity? I'd love to know what you think!